Professional and affordable appliance repair across Birmingham, Solihull & Sutton Coldfield. 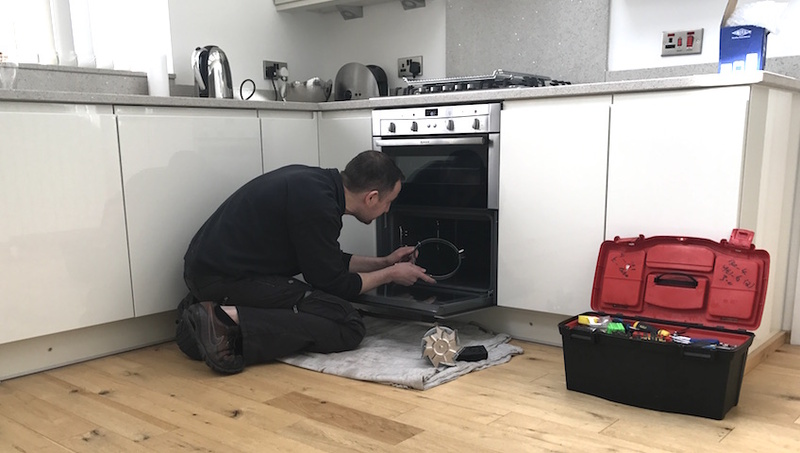 Appliance Repair Man is based in Birmingham and offers an affordable, trustworthy and quick repair service for washing machine repairs, Dishwasher repairs. tumble dryer repairs, electric oven repairs and hob repairs. Domestic appliances are a vital machine in any home and when they break down or incur faults it really puts pressure on the smooth running of your household. At Appliance Repair Man Birmingham we aim to be with you on the same day you call ( where possible ) due to our expertise and large stock of parts, we also try to fix all repairs on our first visit. Unlike some companies we offer a fixed fee quoting system so you know you are receiving a quality service at the right price. We are a long established business and our confidence in our work helps us offer you a 12 month guarantee. Excellent service and reasonably priced too. Had a problem with my washing machine. It was sorted within 1 day and now works perfectly again! Would highly recommend this professional and friendly repair man! I would highly recommend Paul. He fixed my Dishwasher & Oven. Reasonable Costs for repair. Nice guy. Absolutely brilliant! Mom returned from major surgery wanting me to set up her washin machine bang blue flash and dead machine with washing inside. I'd used Paul before to rescue my machine and knew he would help mom. His call out was quick and diagnosis unquestionable. He helped mom select the right machine for her (decent drum size and must have super fast spin) Paul recommend 3 machines and mom chose the Beko 1500 spin machine. Arrived Saturday afternoon great sense of humour especially as mom was suffering pain kept her entertained! Very clean tidy worker and join in the family banter. Couldn't wish for better very highly recommended. excellent - patiently persisted at finding a solution to repair our oven, despite having to make a number of visits on. a fixed price repair. Highly recommended. Brilliant friendly service! Turned up when he said he would. Didn't over charge or try and charge me for parts I didn't need! Would use again and recommend! ? Tumble dryer broke (no hot air, rest ok). Called late Thurs, arrived on Friday. Turned out to be a memory error. Fixed on the spot. Charged a very reasonable fee. Friendly and professional! Excellent! Definitely recommend! Would highly recommend. Very friendly, reliable and reasonable and cheap price. Rang before arriving and arrived on time, explained what was wrong with my washing machine and how to prevent it from happening again! Our Hoover tumble dryer packed in, which is less than 5 years old, so instead of looking to buy a new one, I Googled ‘tumble dryer repairs’, and Appliance Repair Man appeared. Service was top drawer from start to finish. Paul is really friendly and very efficient. Not only did he manage to install the replacement part, making it work again, he also gave it a service & clean. Works like a dream now. Highly recommend. Paul was so helpfull. Rang before arriving and on time. Price very reasonable and would use again and will recommend to friends and family. Thanks again. Great service. Problem with washing machine, door wouldn't register as closed. I called the manufacturer's service number, told flat call out charge ,might be able to get to me next week. Then remembered that I'd used Paul in the past for cooker element. He came out today, fixed washing machine and also replaced bulb in cooker, both jobs a third of the call out charge the manufacturer quoted. Reliable, friendly man. Had problem with my oven not heating up. Phoned in morning and he was with me by 2.30 same day and all fixed in half an hour. Good service, reasonable price. Would use again and would recommend. Fantastic service! Called this morning my washing machine is now working and all sorted can not praise Paul enough! Nice man and fair price! Highly recommend trustworthy and reliable thanks again!!!! Would not hesitate to recommend. Called Paul out to a faulty washing machine, he arrived within a couple of hours and the machine was back up and running shortly after. Honest and trustworthy and a very fair price. Never used his services before and was reluctant to try someone completely new but we made the right choice. Thanks Paul. I had a problem with my electric fan oven. Paul did a fab job and repaired it efficiently. I am well impressed as my oven now works again. The charge for parts and labour was reasonable too. Definately recomend this friendly experienced repair man. Gave me some advice on the phone which meant I could solve my freezer problem myself. So... would be more than happy to use him for more difficult issues, as I like to deal with people who are knowledgeable and straightforward. Repaired electric oven. Prompt efficient. Reasonable price. Would recommend and would certainly use again for all electrical repairs. Paul was extremely helpful, and repaired the condenser dryer at a very reasonable price. Paul is a professional and honest tradesman, and I would not hesitate to recommend. Thankyou! Excellent service, very quick very neat and tidy, definitely would recommend. Bosch dishwasher sudden loss of electricity, Paul came to repair, it was too costly for parts due to the age of the machine. So Paul supplied and fitted a new Bosch at a very competitive rate. Also took all packaging and old machine away. Excellent Service, would highly recommend!!! After reading reviews, I phoned Paul today as my mother in laws cooker had stopped working, I left him a message and he got back to me within 15 minutes, he told me he could be there in a couple of hours which he was, he also phoned me 15 minutes before he arrived. I couldn't be more pleased with service we received , and , as many other reviews have said, Paul is a really nice , genuine and honest tradesman who completed the job at a very reasonable price. Would definitely recommend and use again. Would highly recommend,was polite on the phone when I called to arrange a time he could come out to fix my fan oven. Kept me updated on the day of when he would get there and when he arrived was nothing but polite and professional. Fixed the oven quickly,it needed a new fan and element,which is what I had guessed and left no mess. Price was very reasonable and less than I expected. Great service and good price, would highly recommend. Explained the issue and fix as well as cost before any work was done. Have used on multiple occasions as a result. Called about a faulty cooker. Engineer arrived exactly as planned the next day, with a courtesy call beforehand. The problem was quickly diagnosed and a new element fitted. Service was tidy and cheerful and at a very acceptable price. Have used this service before and will not hesitate to do so again. Really helpful, polite and respectful. Came to look at a tumble dryer that wasn't getting hot. He told me the problem after having a thoroughl look and told me the price. Really fair and tested in front of me before he left leaving his card in case any issues. Would definitely recommend!